He-Man Hooks - Hang pictures, mirrors and more. The easiest and most secure way to hang picture frames, shelves, mirrors and more. These amazing hooks are extremely easy to use, and don't require any tools. There is no hammering or drilling involved, and you don't even need to find a stud. Hold up to 150 pounds with just these hooks in drywall. Now you can hang everything you want in no time at all. Never worry about damaging walls or leaving behind gigantic holes. A small little pin hole is all that is left when you remove one of these hooks from the wall. The secret is the reinforced steel design that penetrates through any drywall, plaster or wood wall and braces itself to the backside. This incredible design displaces the weight and allows you to hang up to 150 pounds. These hooks install in seconds, and won't pull out. These have been sold on TV as Hercules Hooks. Ours work the same way, but they cost less. 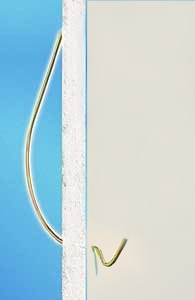 Superior steel costruction makes these hooks rugged and sturdy. They install in just seconds and hold an incredible amount of weight. The He-Man Hook is the easiest way to hang pictures, mirrors, shelves just about anything. They are easy to install. Jjust twist, push and turn! No more drilling or pounding to try to find a stud. They work great on any type of wall, even for plaster or paneling. Hang it anywhere you want to. The He-Man hooks can make it happen. Forget about stud finders, special hardware or complex tools. These hooks make it simple to hang even bulky items in no time. They are great for anyone who rents, interior designers or anyone else that wants a quick and easy way to hang pictures, mirrors and more. Decorate your home in no time with He-Man Hooks from us. Order Yours Today! Dimensions (l x w) 4.5" x 3"
He-Man Hooks - Fast and Easy-to-use. No tools required and no studs to find. Hang anything on your walls in seconds. Buy Yours Today! These are the best hooks.. If you buy them you will not be disappointed. When I was living in New York that's where I first discovered he-man hooks.. When I moved to Virginia I remembered I had some hooks that we're good but couldn't remember where I bought them from. Thank you and I will be reordering some more in the near future. Thank you. They arrived promptly and are great for hanging pictures – very easy to use and leaves only a tiny hole if you want to move your picture. Best picture hooks I’ve ever used. I've bought these before, same quality work good, a little costly. How do you remove the hooks when you are done using them? Downward pressure keeps them securely in place. When you want to remove them, it can be easily done by just rotating and pulling with your hand.